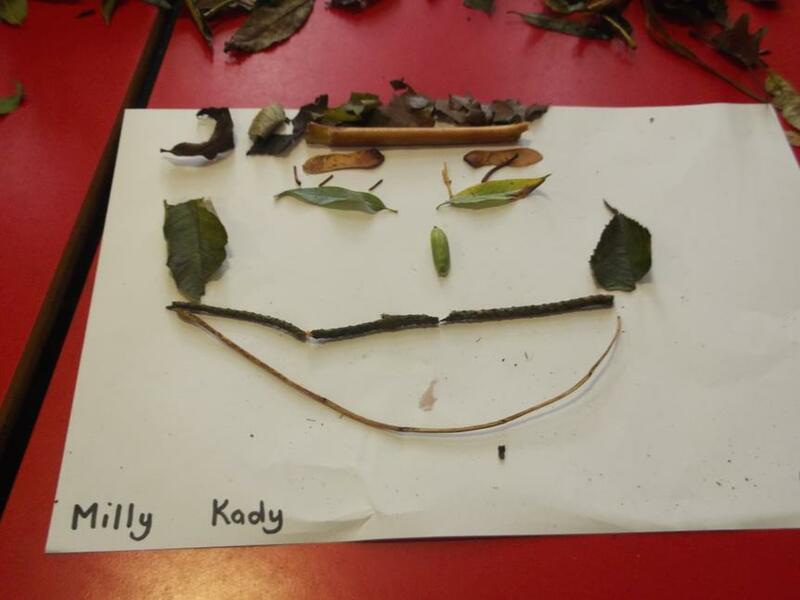 Mrs.Kelly is the year 1/2 class teacher and she is supported by teaching assistants Mrs.Halshaw, Mrs.Lee, Mrs.Townley, Mrs. Nield and Miss. 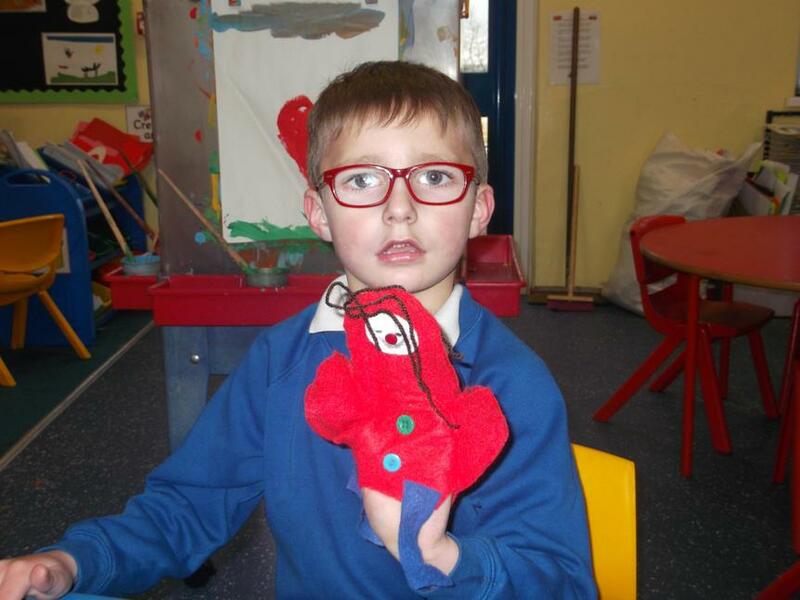 Duffy. 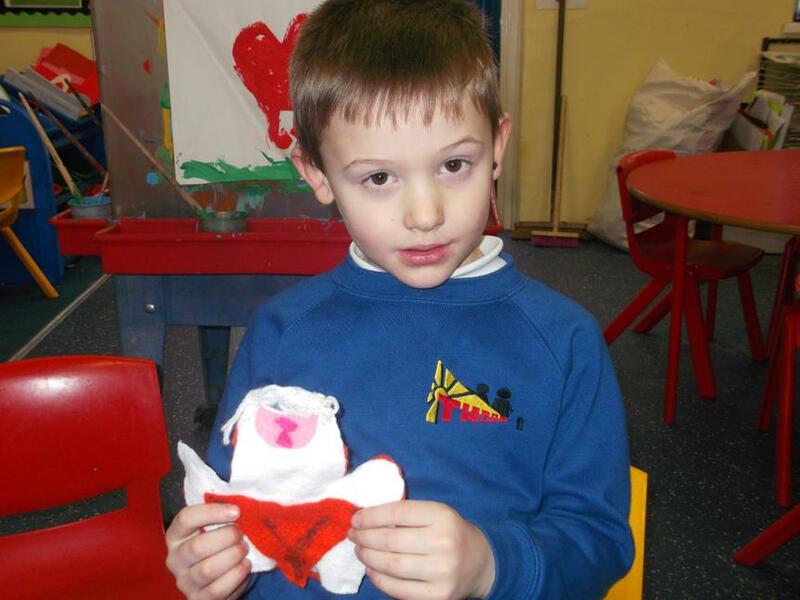 There are currently 25 children in the class. 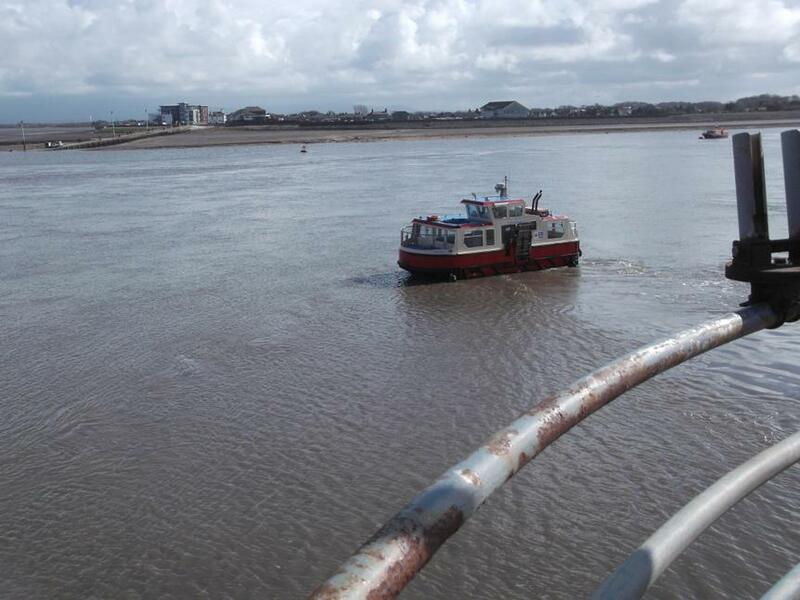 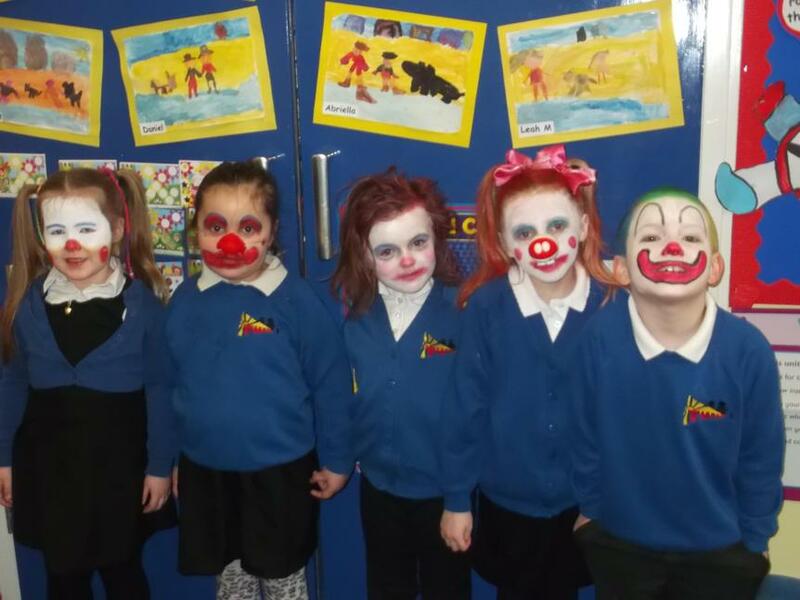 The children go swimming on Wednesday and have P.E. 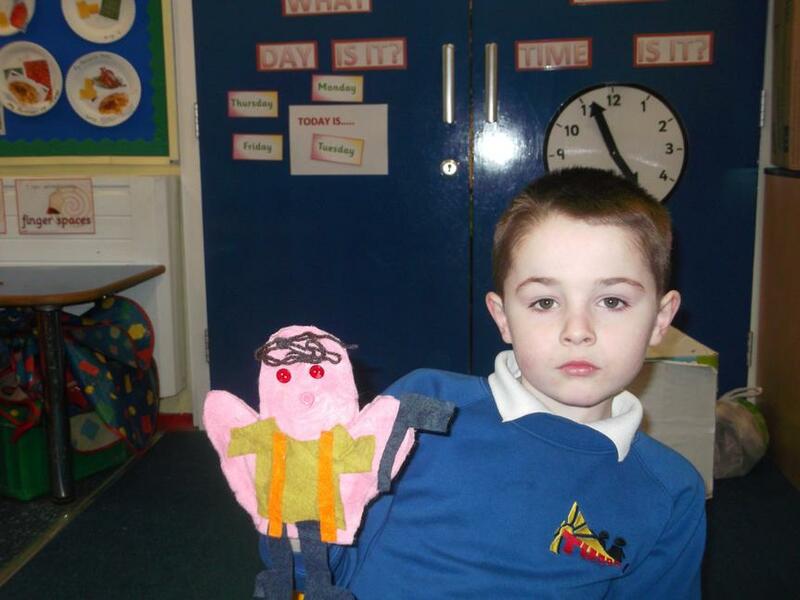 on Friday. 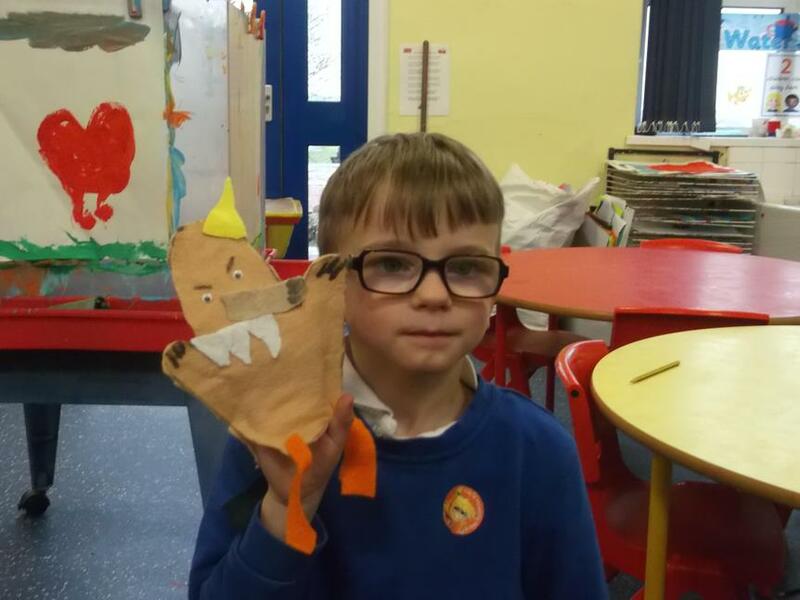 Home reading books are changed on Mondays, Wednesdays and Fridays. 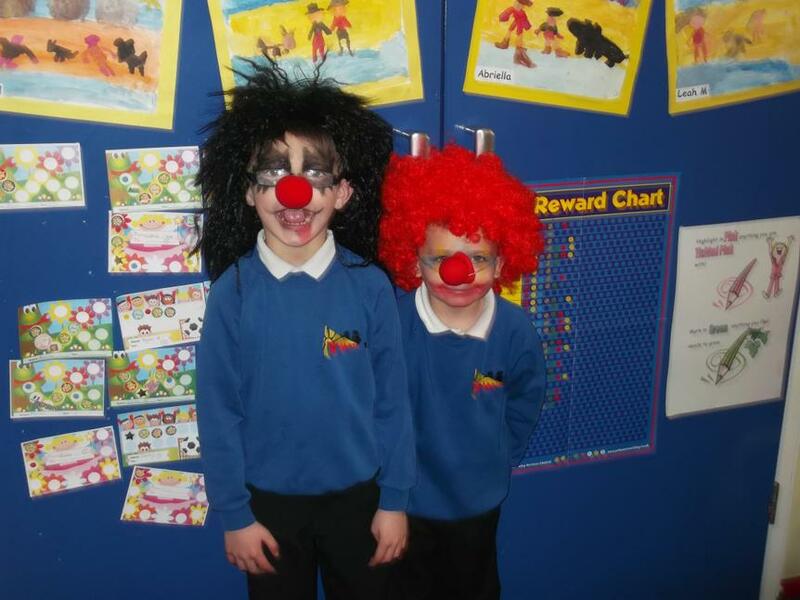 Homework and spellings are given on Fridays to be returned completed on Monday. 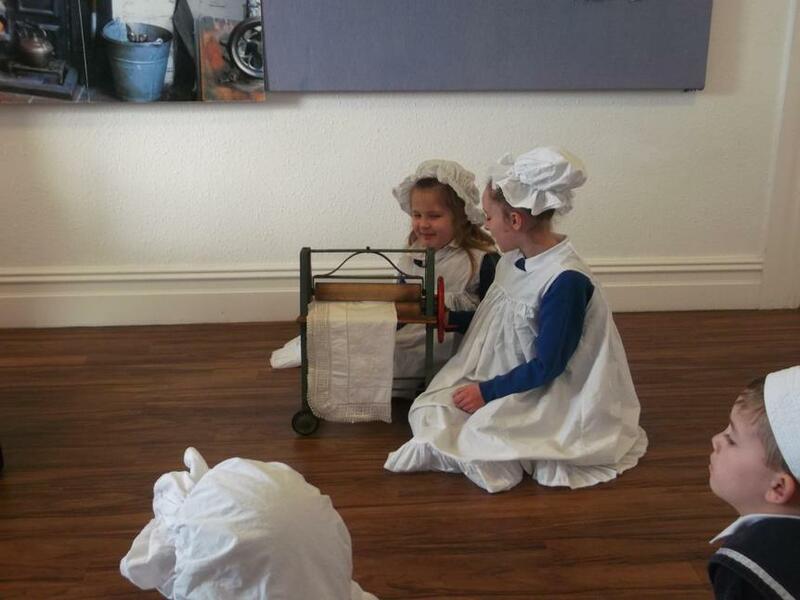 This half term we have enjoyed our history topic about the famous scientist Mary Anning, fossils and dinosaurs. 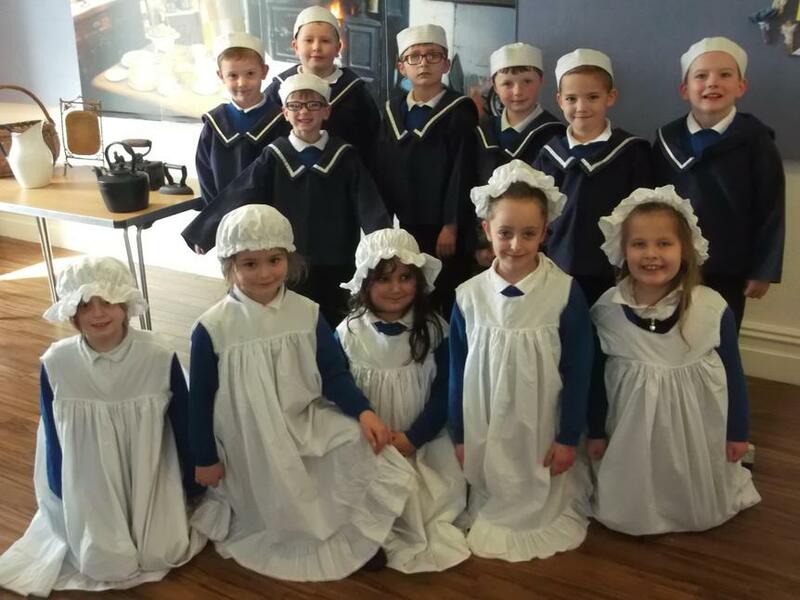 The children have learnt about the life of Mary Anning and how she became famous by finding an Ichthyosaur(fish lizard) fossil in Lyme Regis. 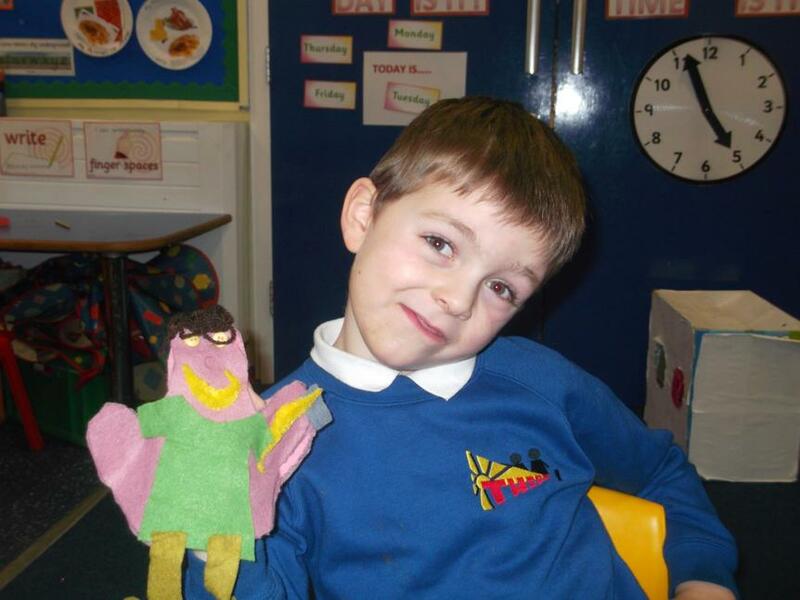 In Literacy we have read and wrote stories, information and poems about dinosaurs. 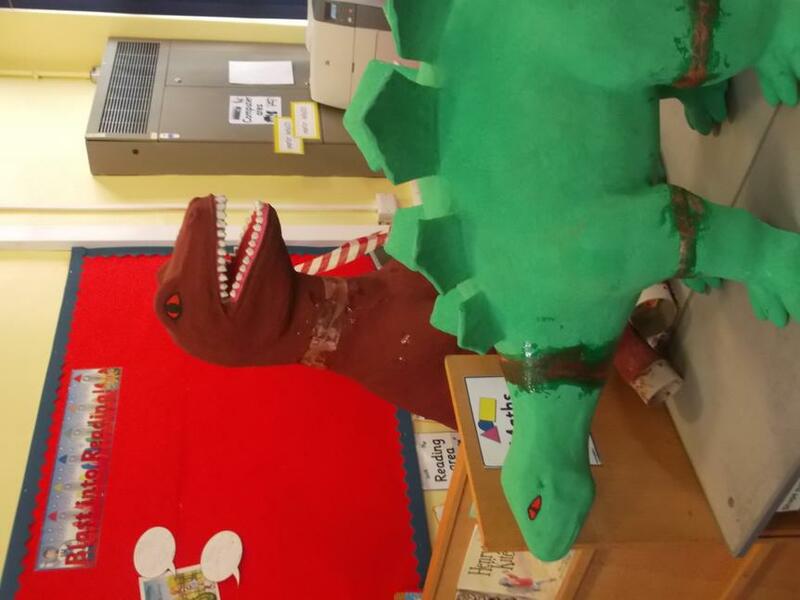 We made two giganitic models of dinosuars, which will eventually live in the schools outdoor environment! 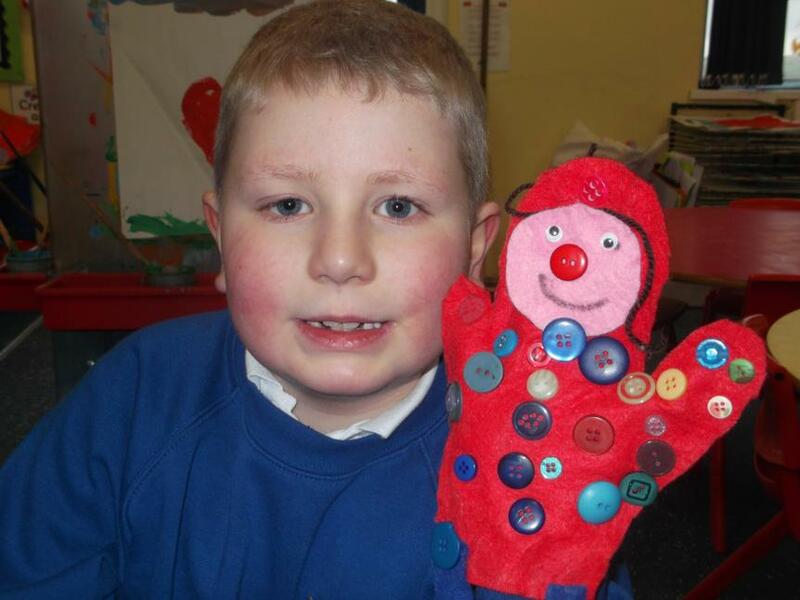 In science we have been learning about materials their uses and how they can be changed. 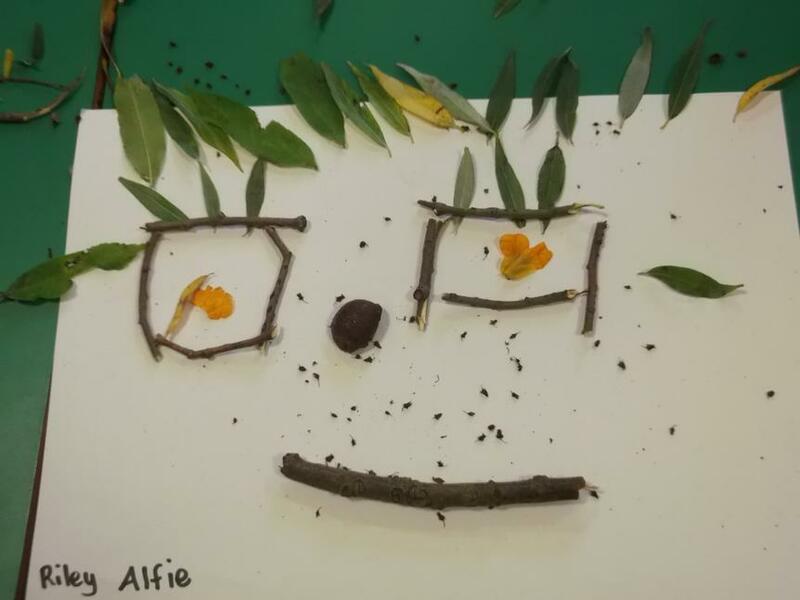 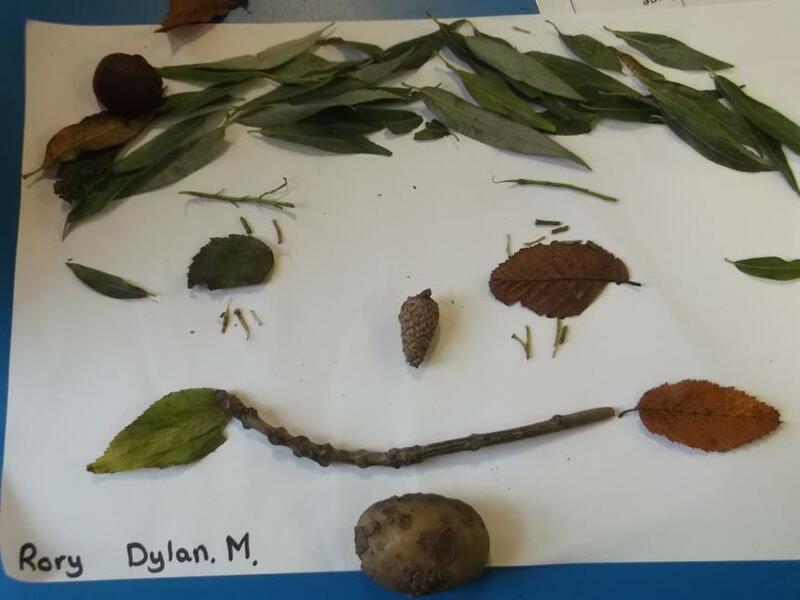 In the last week before half term we enjoyed plant week. 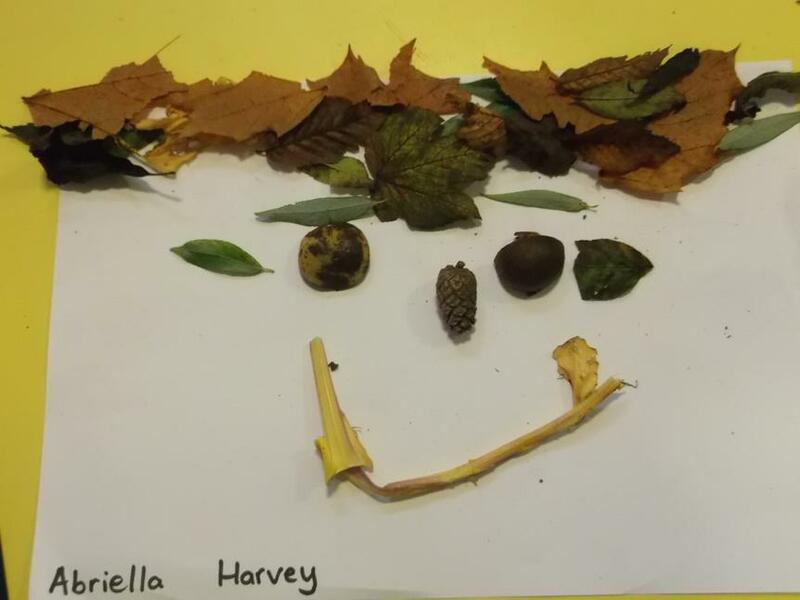 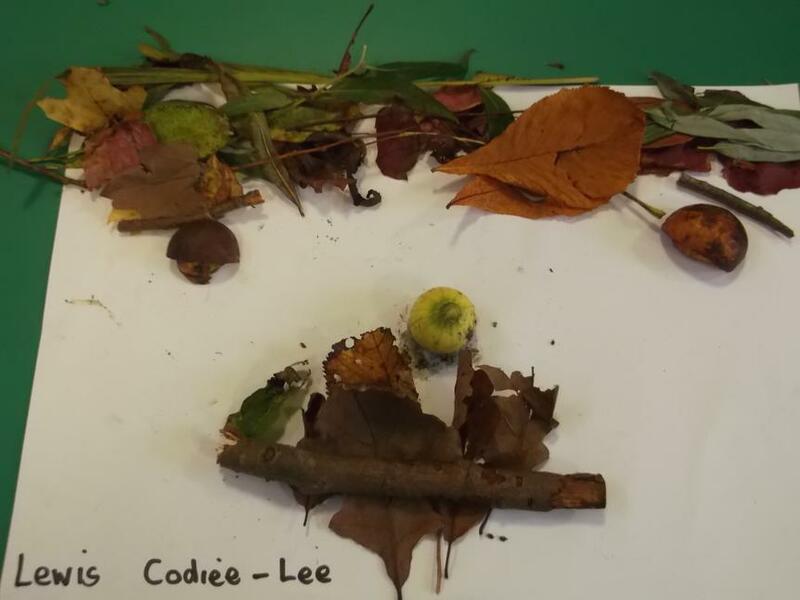 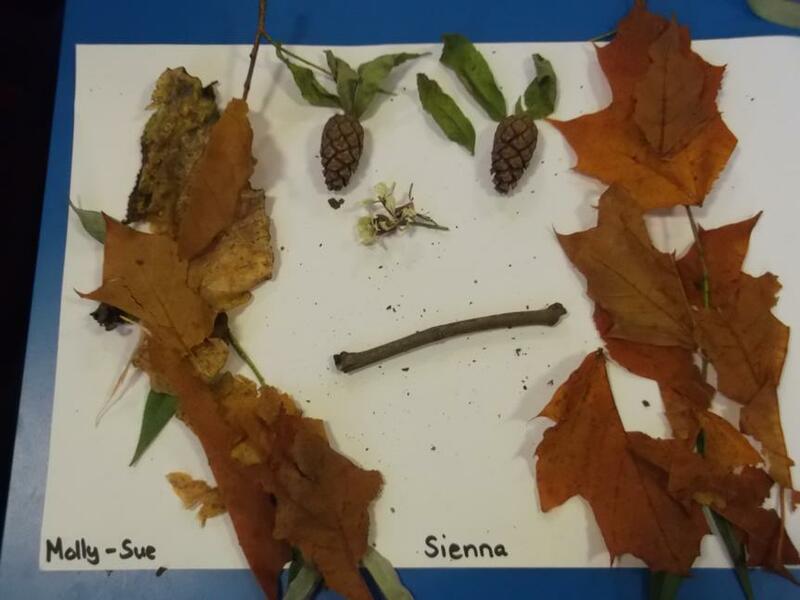 We went on an Autumn walk to collect leaves and seeds and identified these. 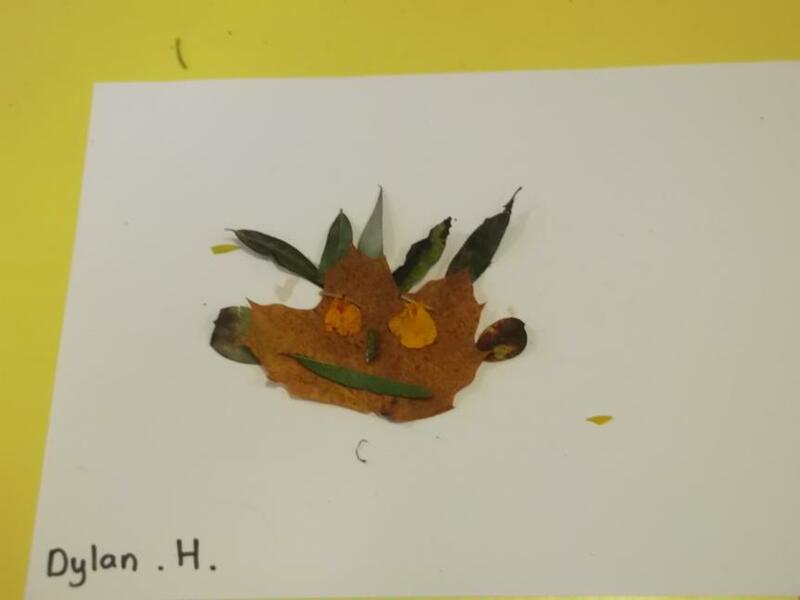 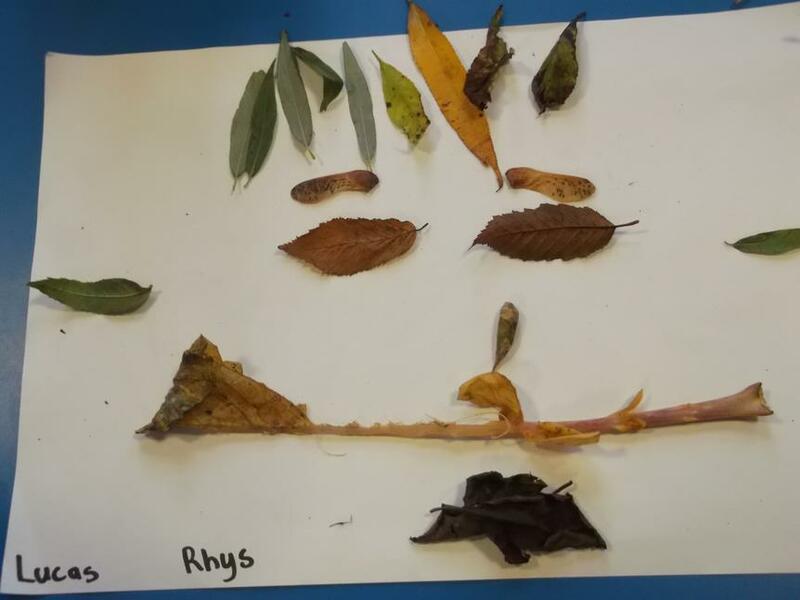 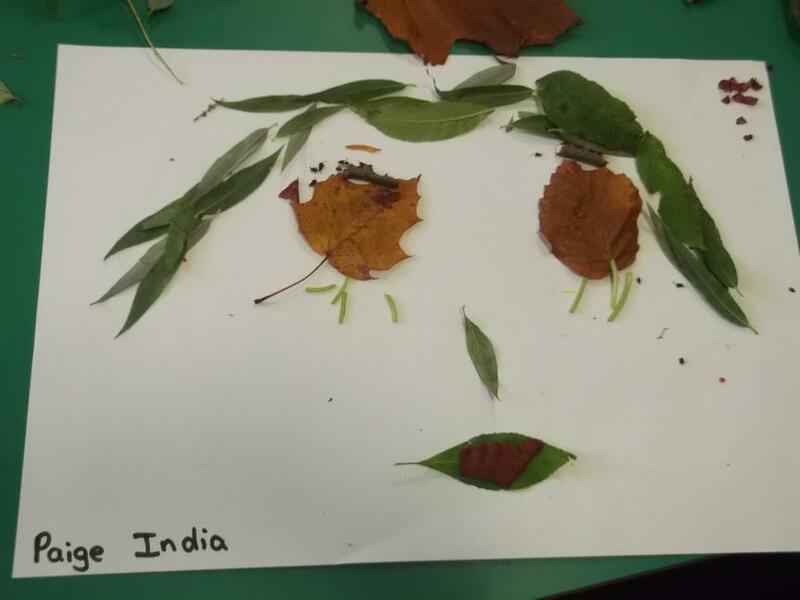 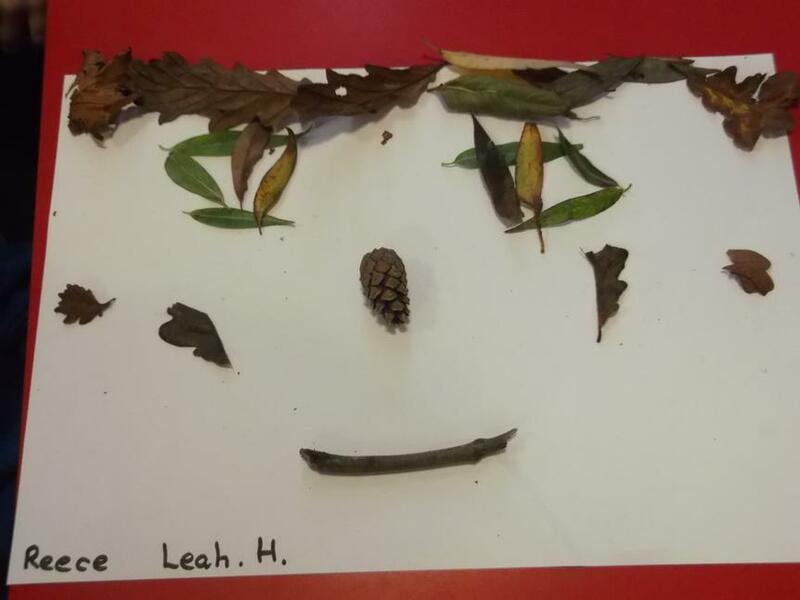 We used them to print and make autumn trees and create collage autumn faces. 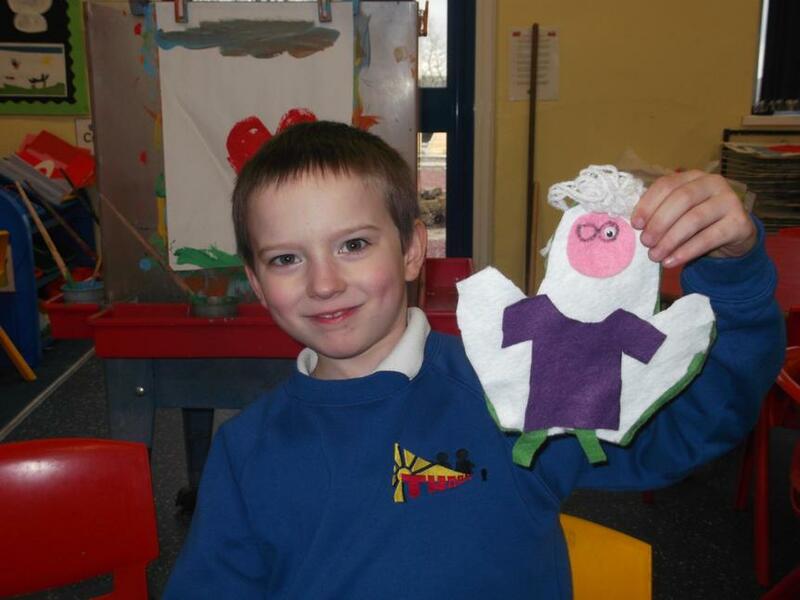 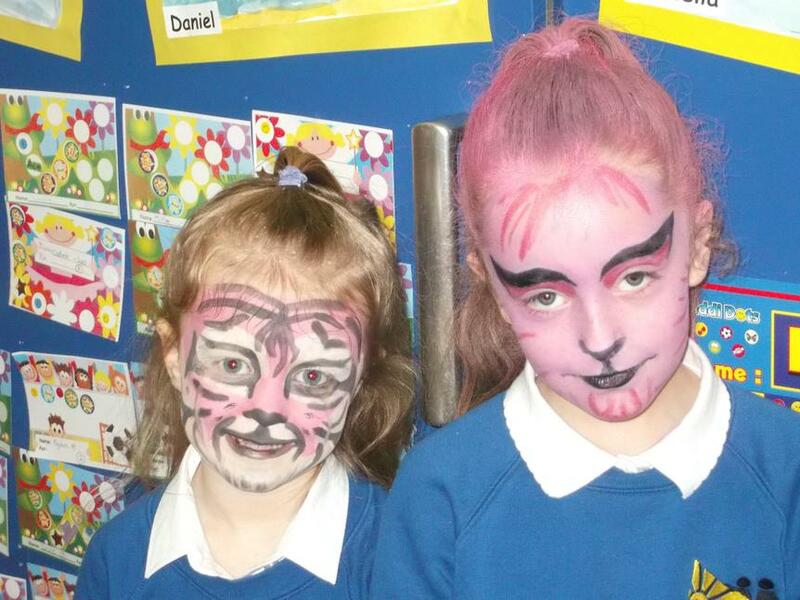 The second half term in Year1/2 has again been extremely busy. 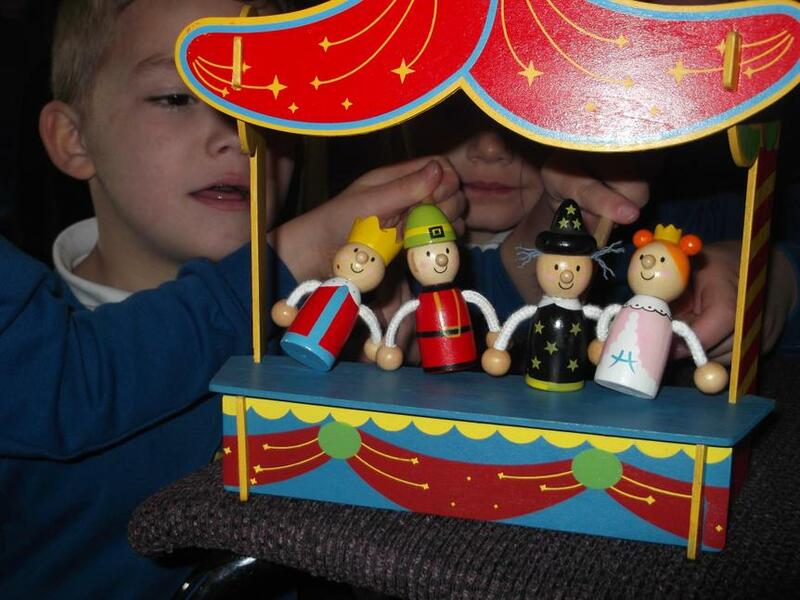 We started our History topic with a visit from a Mobile Planetarium-see the pictures below. 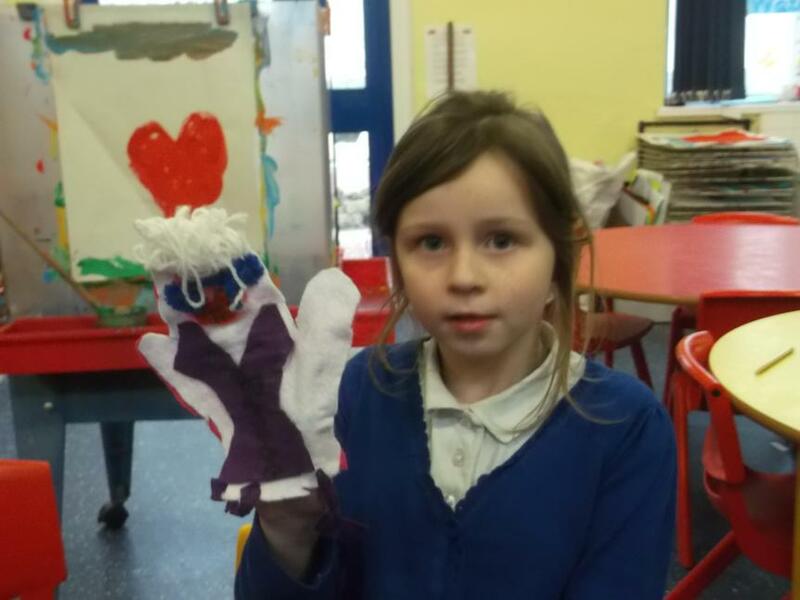 The children really enjoyed learning about Neil Armstrong and the first moon landing. 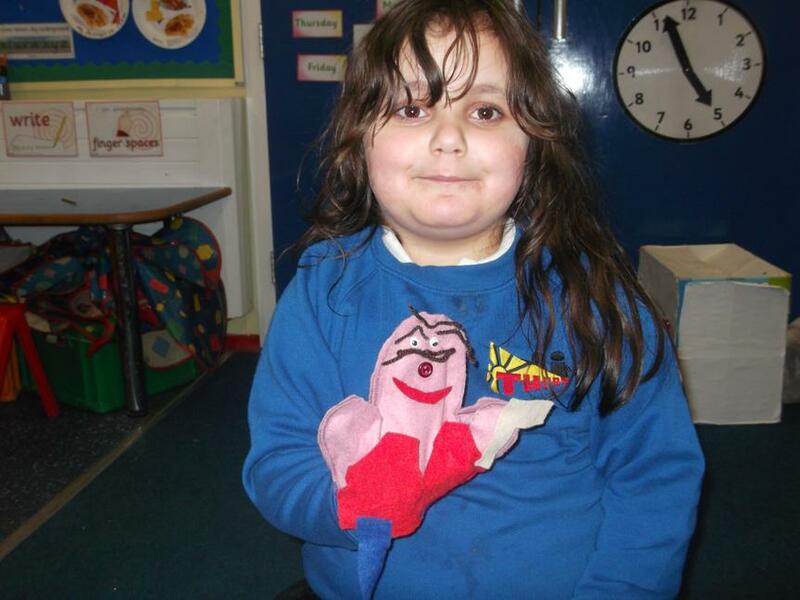 We designed and made rockets and used Van Gogh's famous painting Starry Night as inspiration for our own paintings. 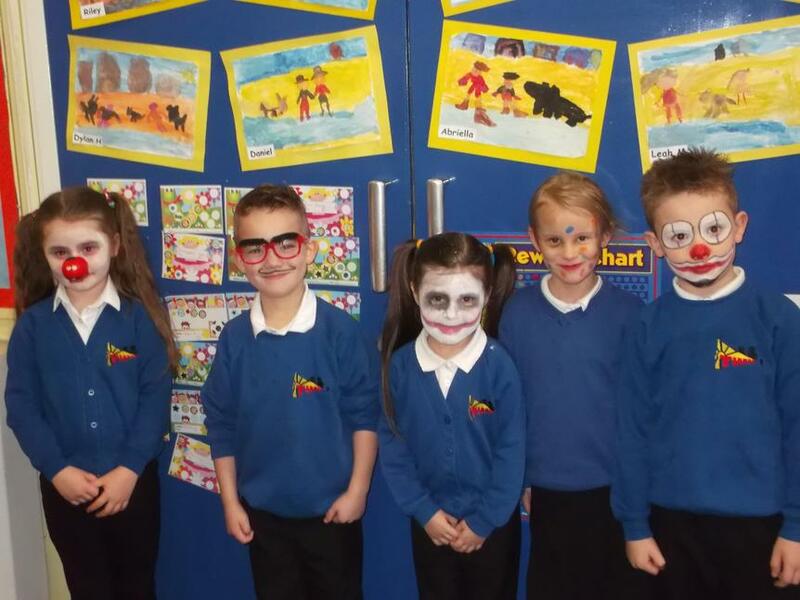 To raise money for Children In Need the children came to school in fancy dress-more pictures below. 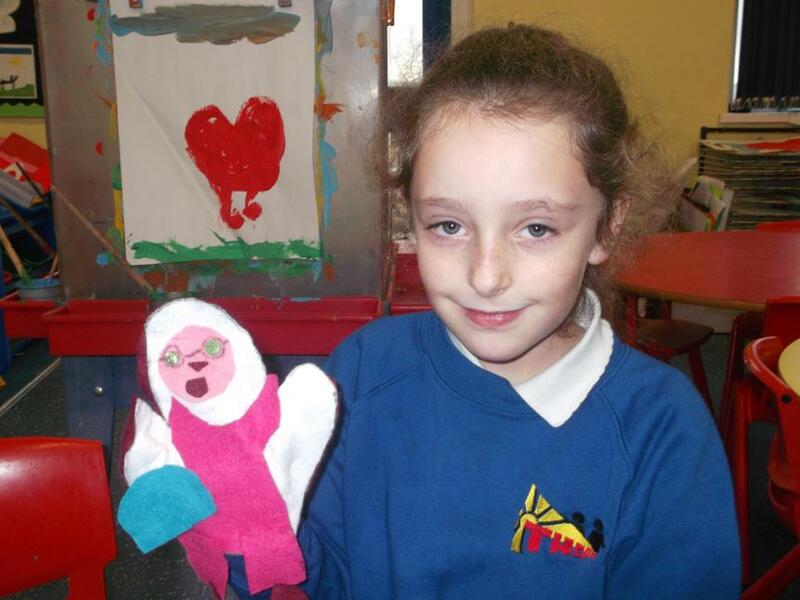 In the last few weeks before the Christmas break the children were busy practising for our Christmas Concert Rock around the Flock, which we all enjoyed, especially the songs and dances. 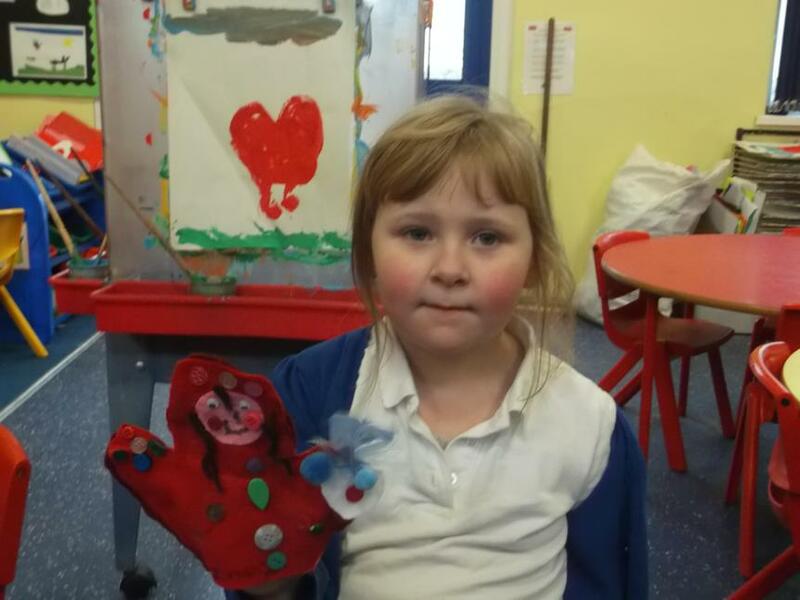 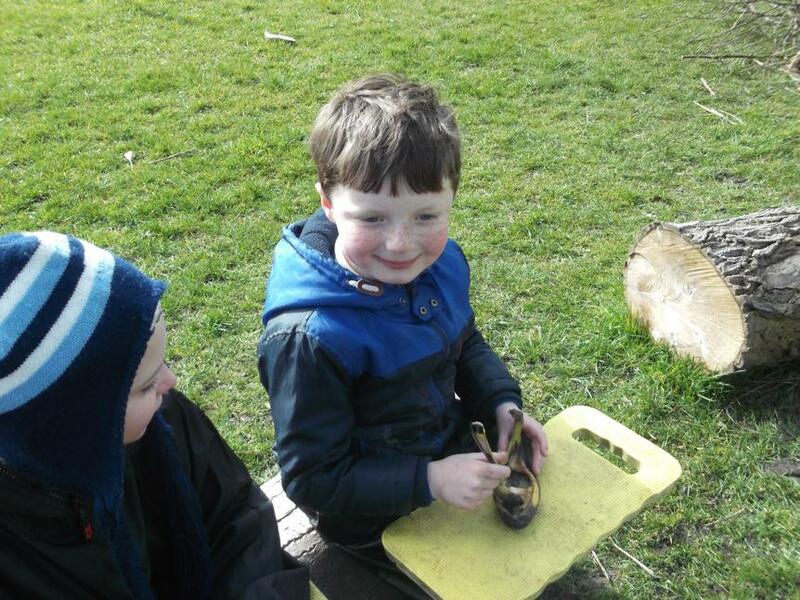 It has been a busy first spring half term again in Year1/2. 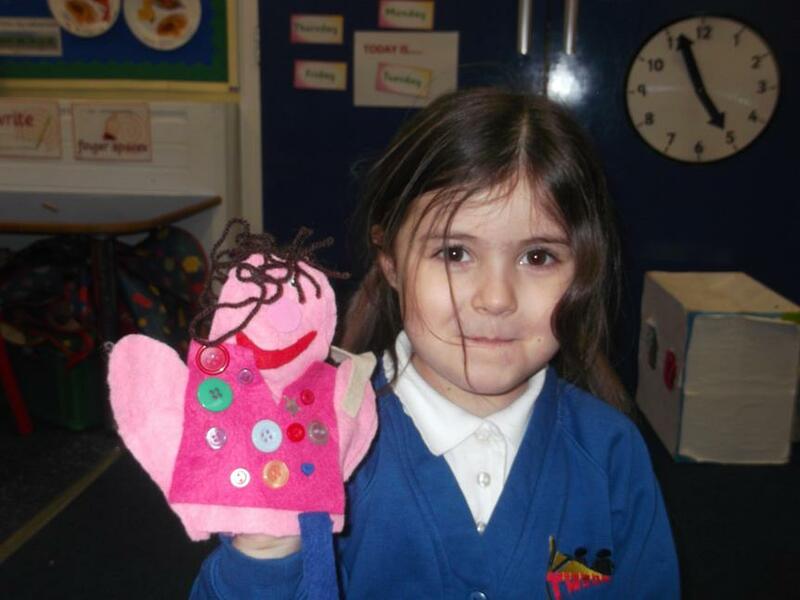 In science we have been learning about Keeping Healthy-the importance of a healthy diet, exercise and hygiene. 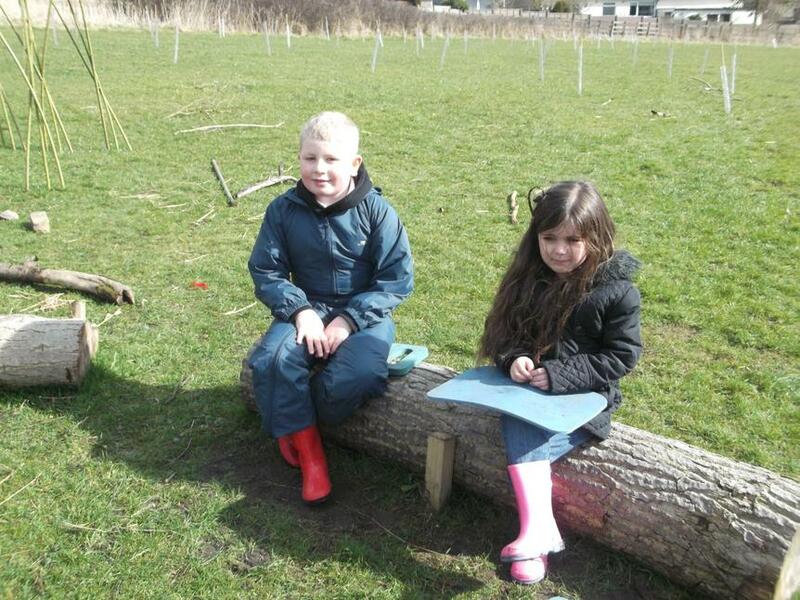 We have also been learning about our local area and where we live. 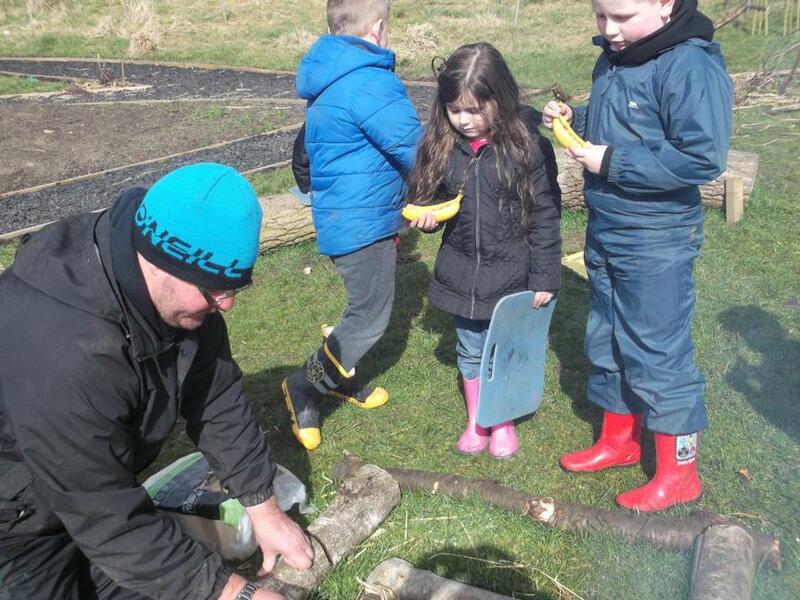 When the snow came we had a great deal of fun at playtimes building snowmen and igloos. 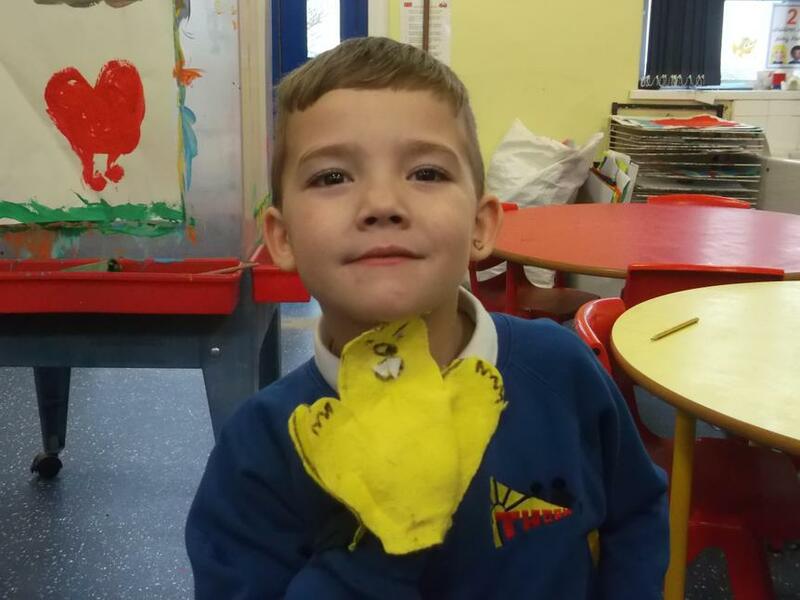 We finished our block of swimming lessons with a fun day and we all received our certificates for our efforts in improving our swimming skills. 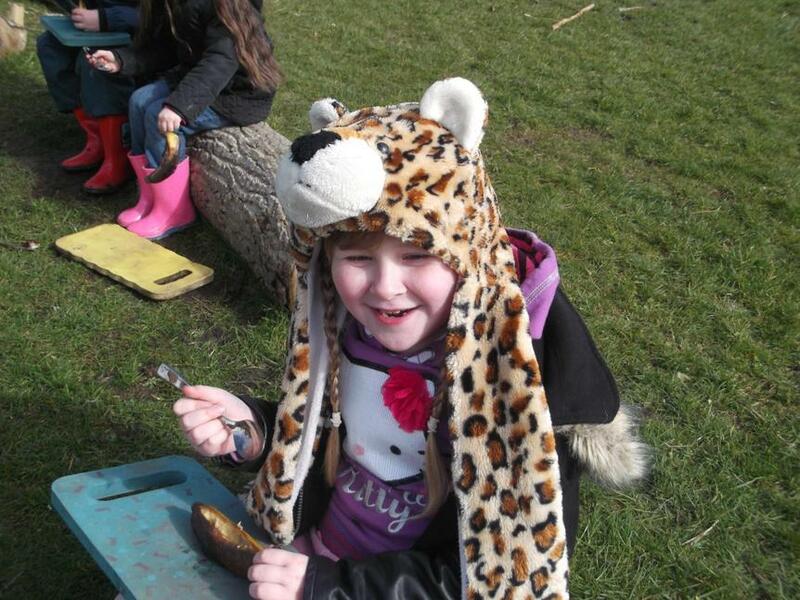 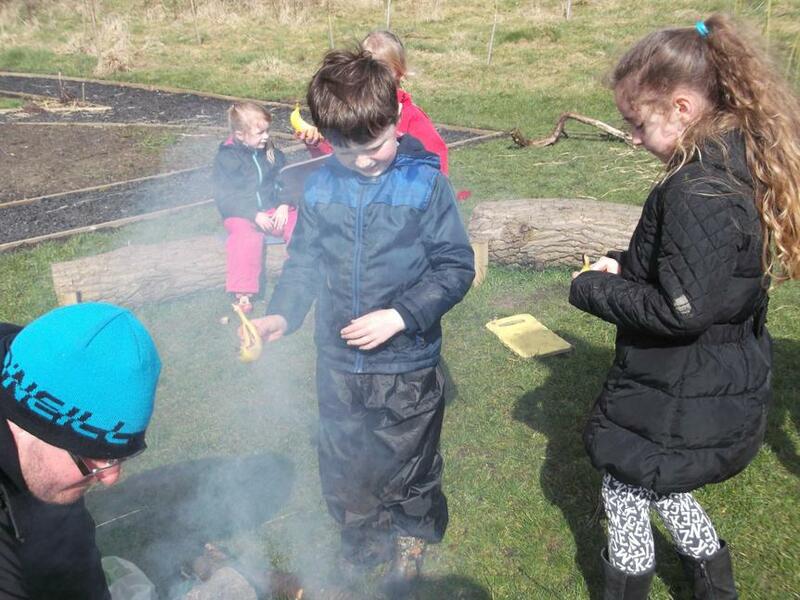 As part of our Literacy work we used the outdoor environment to study Traditional Tales with a twist. 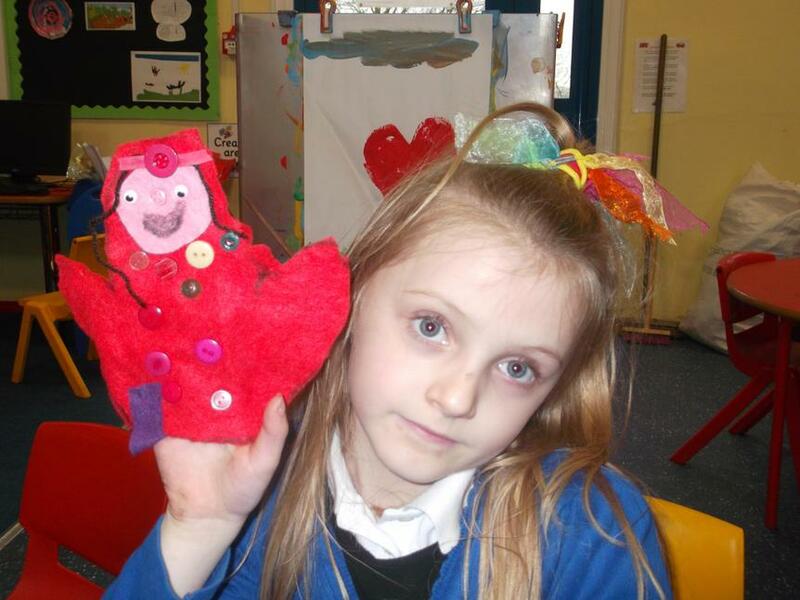 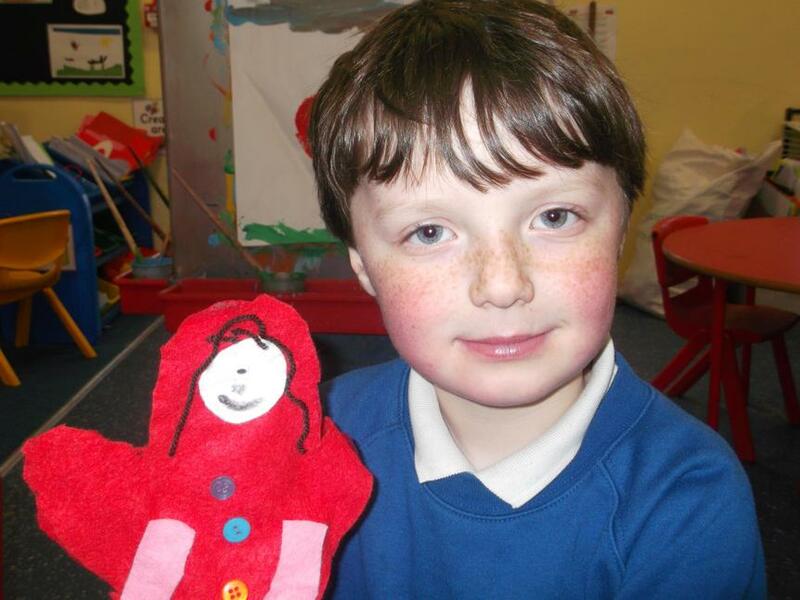 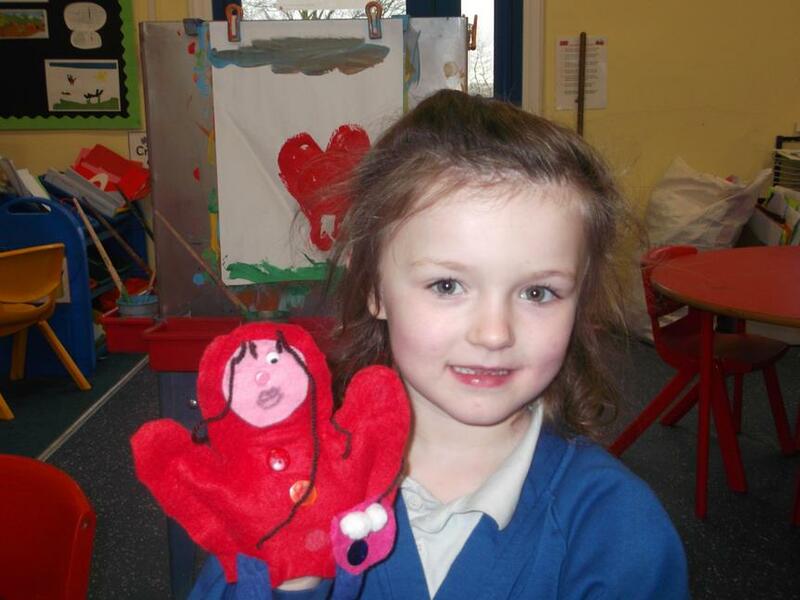 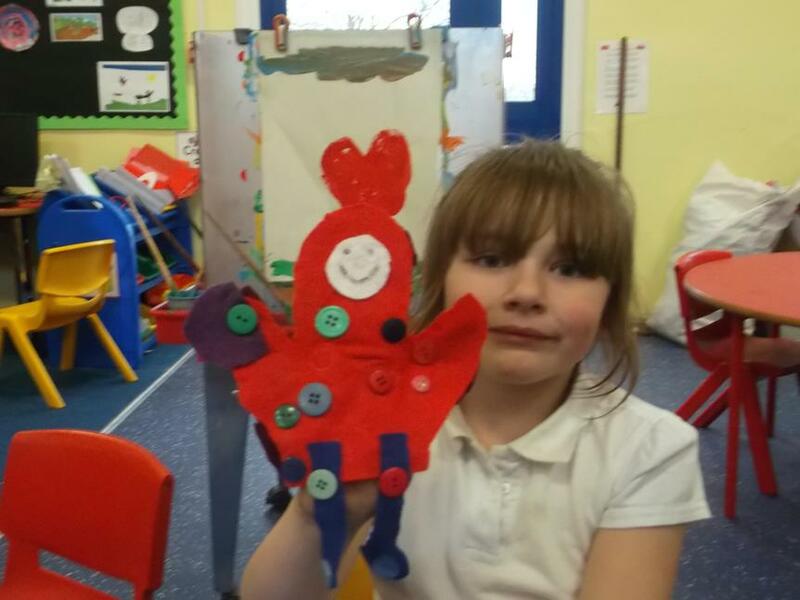 We designed and made puppets of the characters of 'The True story of Little Red Riding Hood and the Wolf' and then acted out the story in the outdoor area. 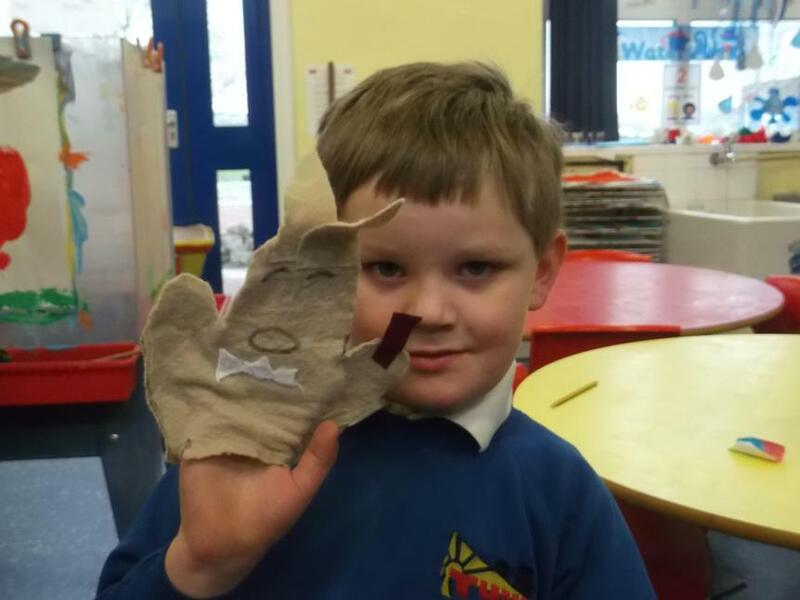 We took digital photographs and then produced our own photo-stories. 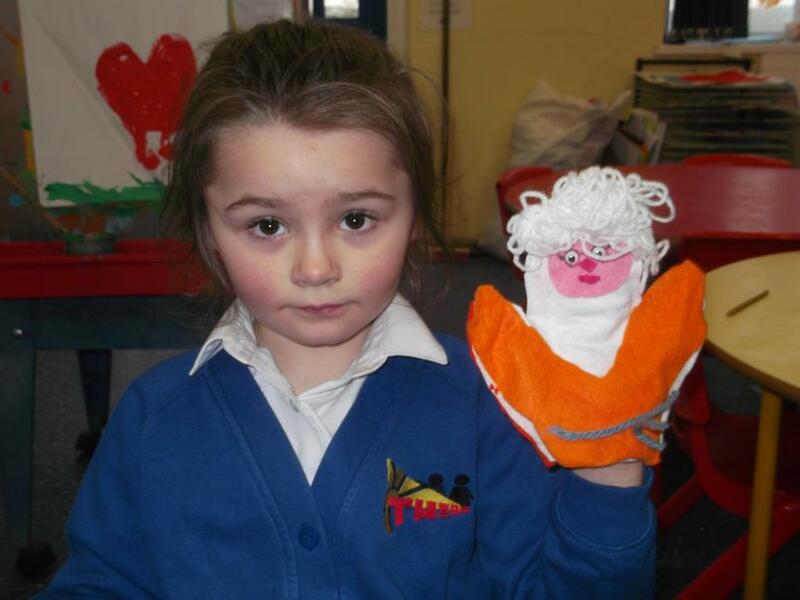 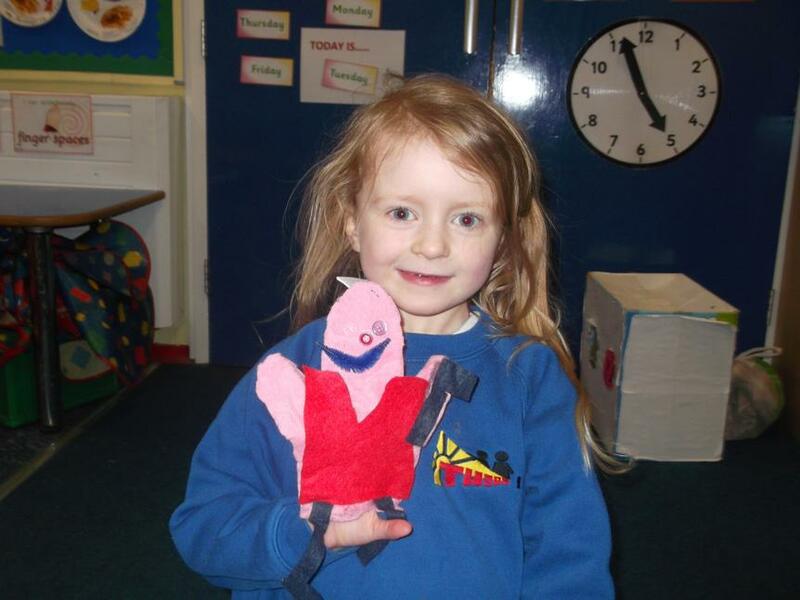 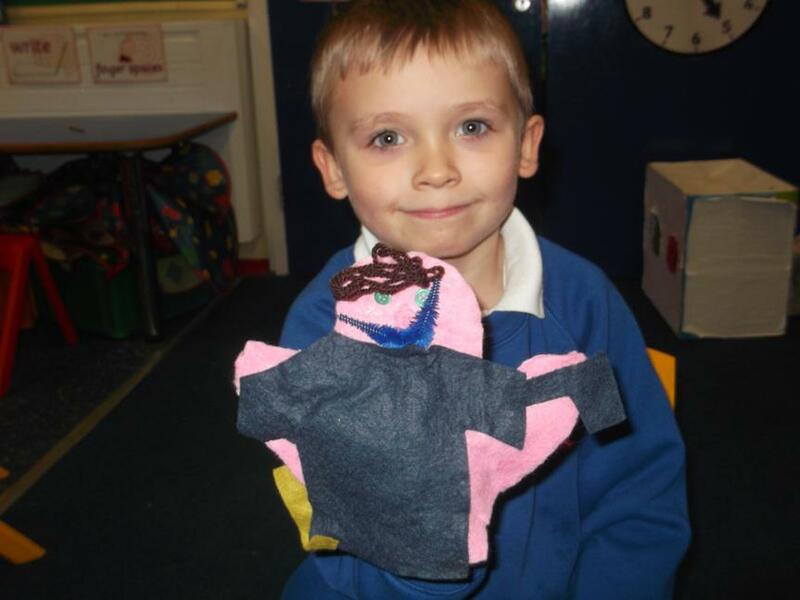 Again it has been a busy time in Year1/2. 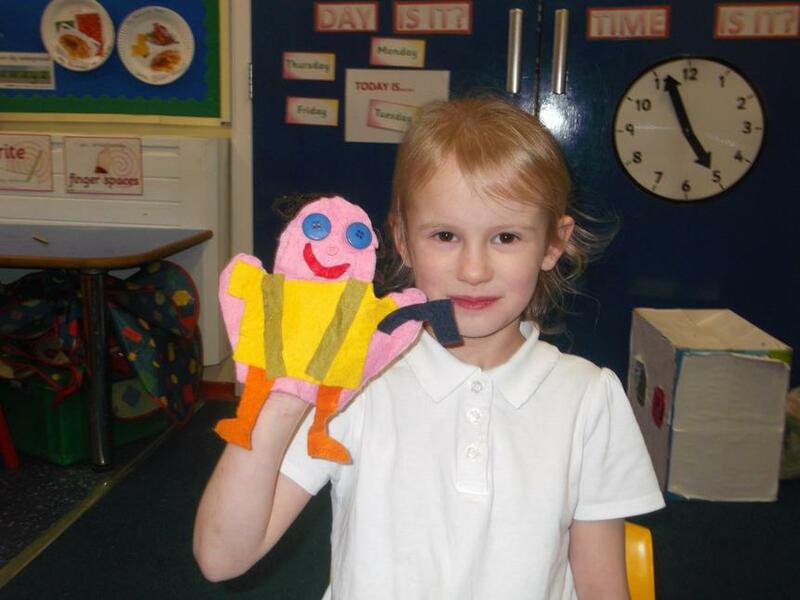 We learnt about the country Brazil and compared it to where we live in Bacup. 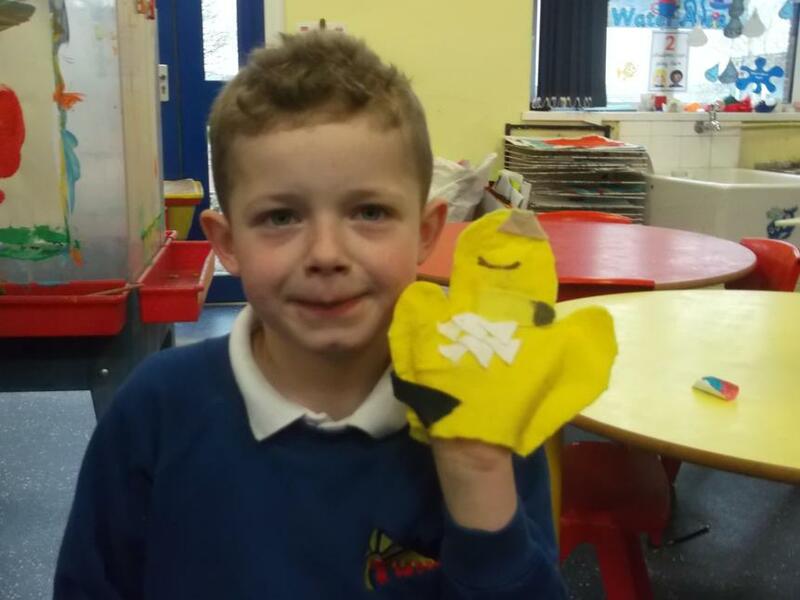 We have been developing our computer programing skills by using the Bee-bots. 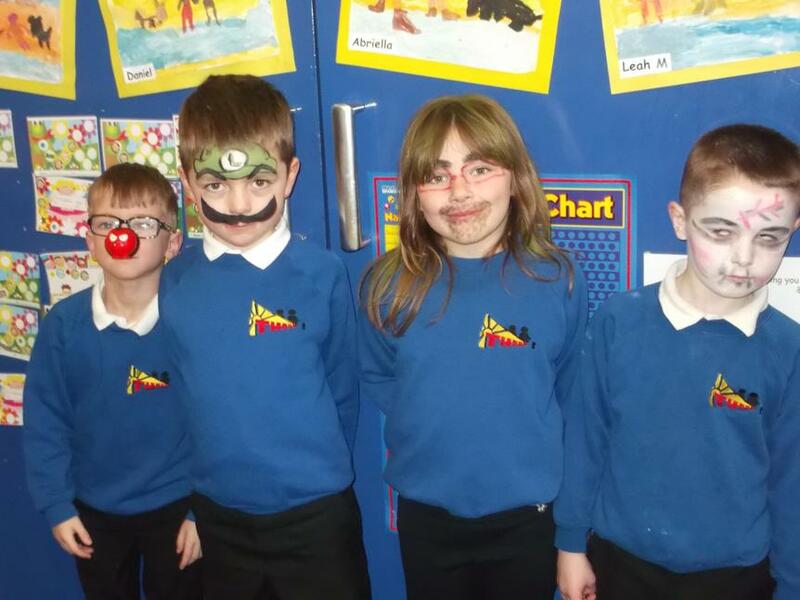 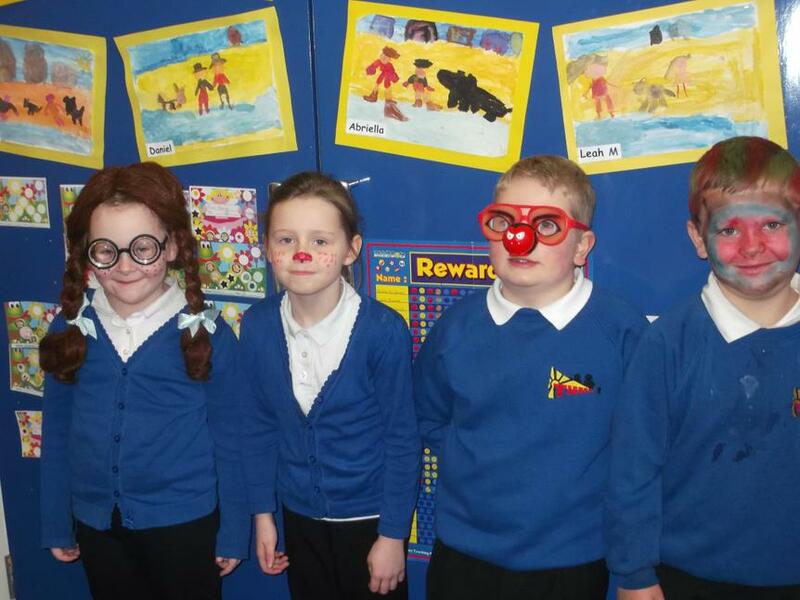 We enjoyed raising money for Comic relief by wearing wigs and painting our faces-see how funny we look below. 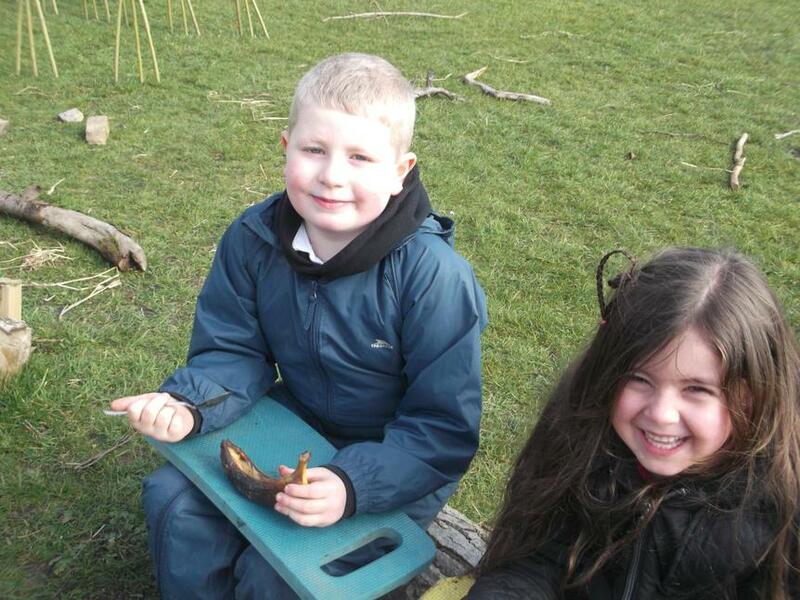 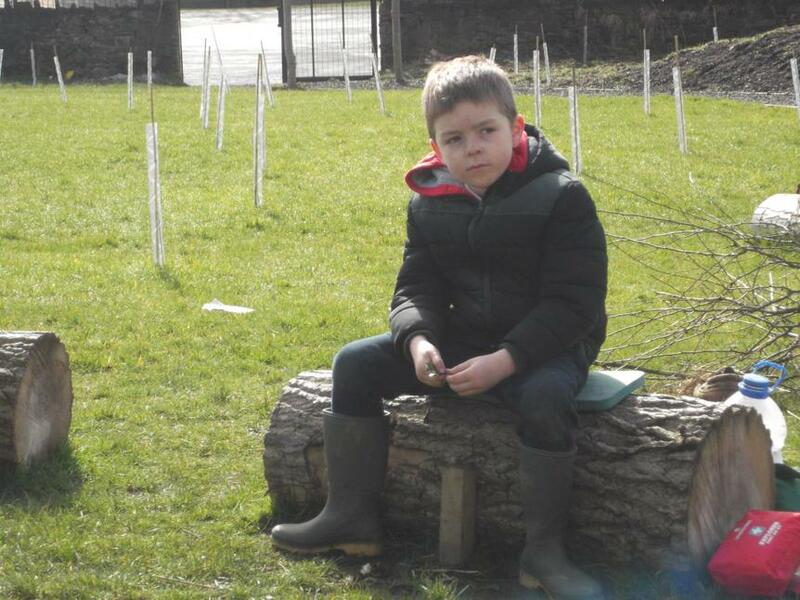 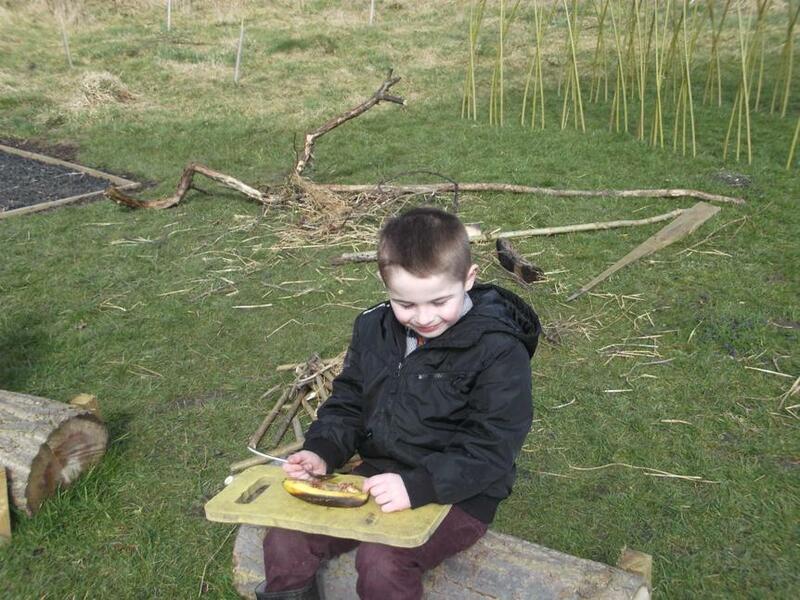 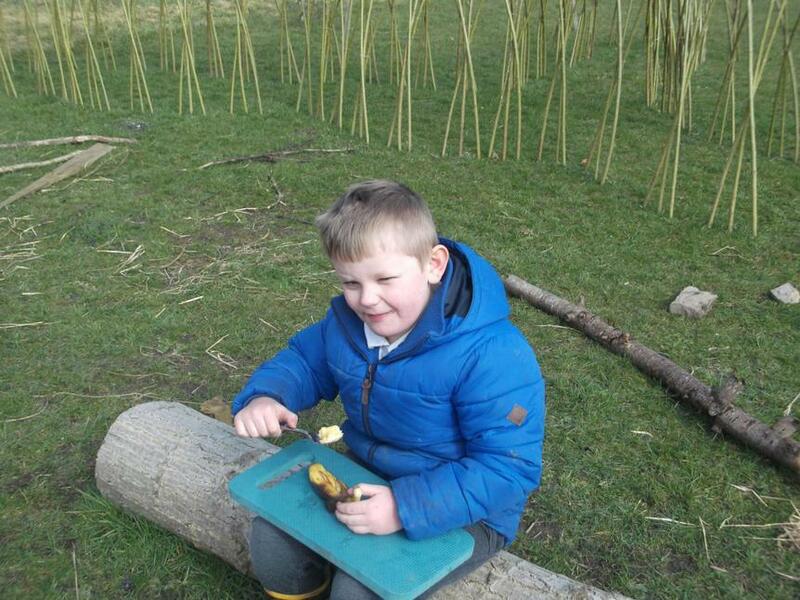 We also had the opportunity to develop our skills in the outdoors by working with Dan in the Forest Schools area. 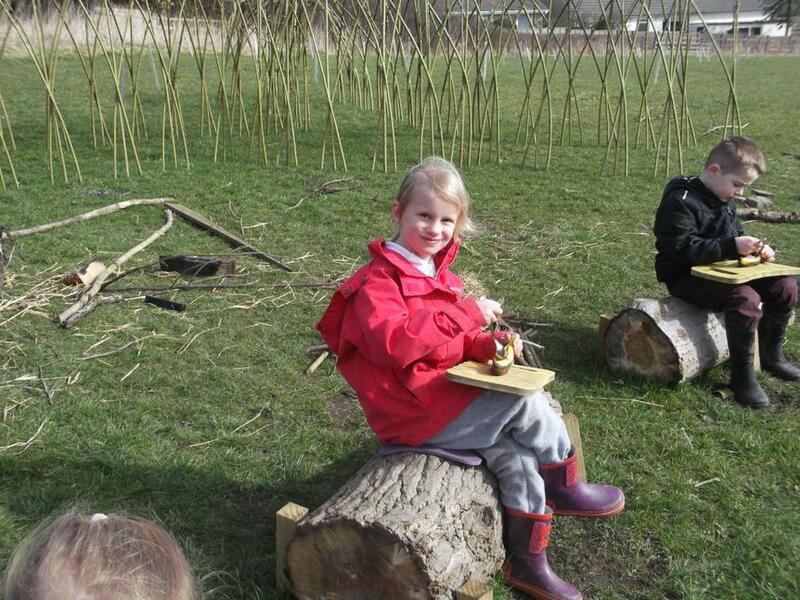 We had to work as a team to make towers and the letters of the alphabet using natural materials. 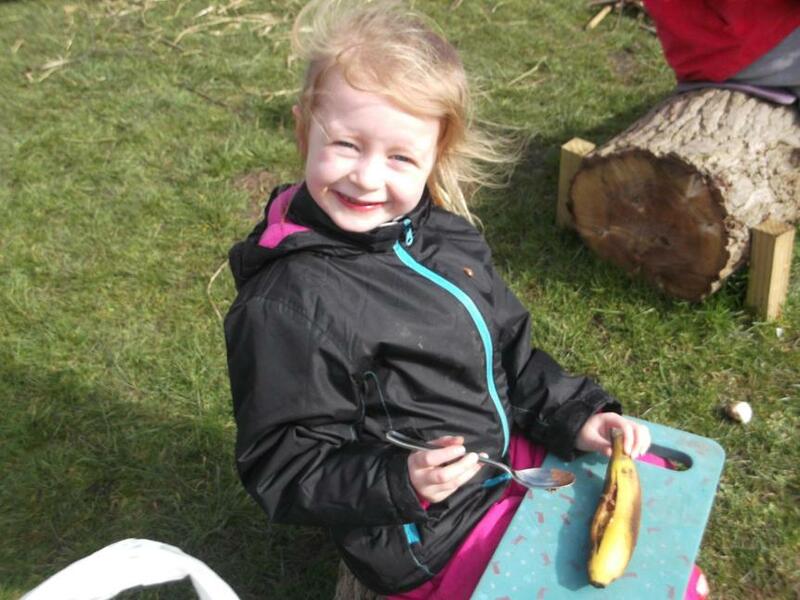 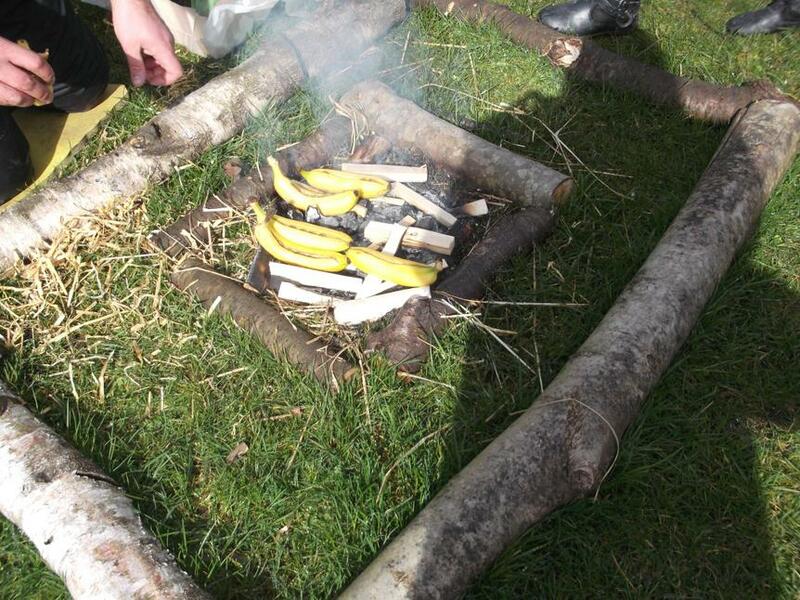 We also played a new style of Hide and Seek, but our favourite part was having a camp fire and cooking bananas with chocolate. 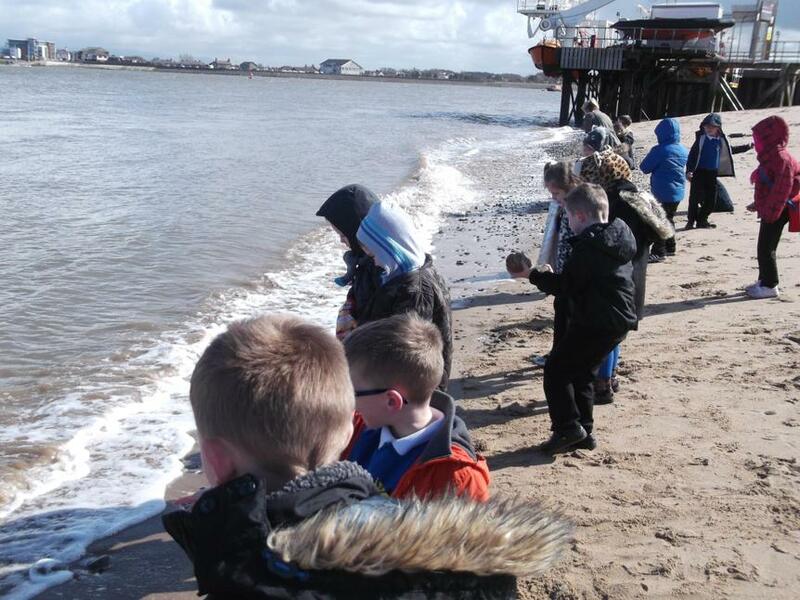 Finally we finished our Geography theme by our trip to the seaside at Fleetwood. 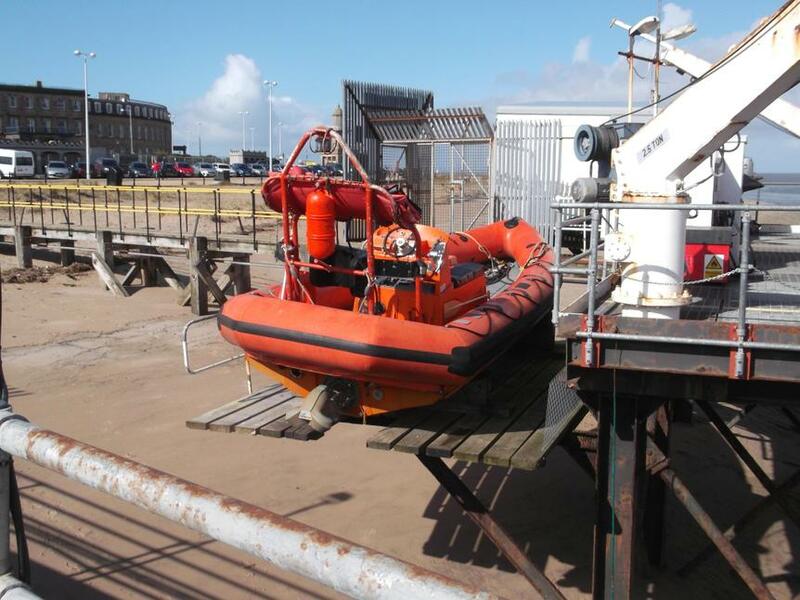 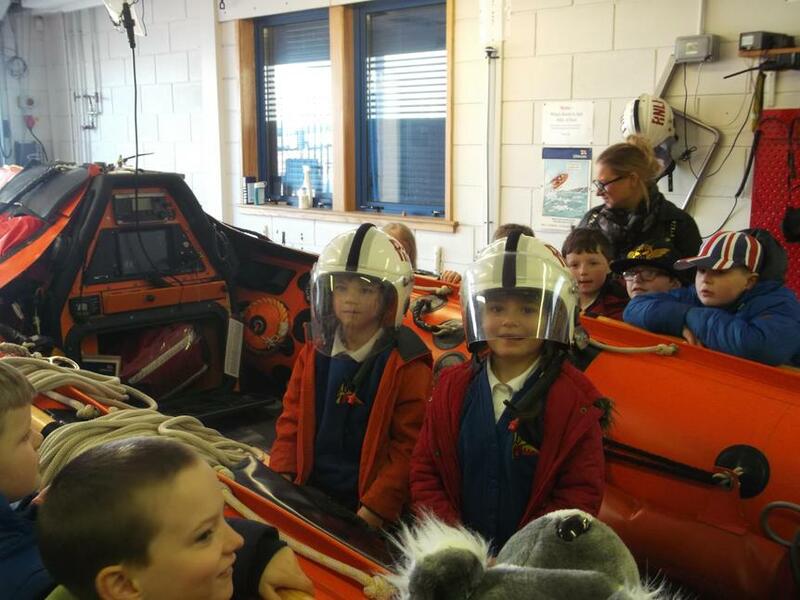 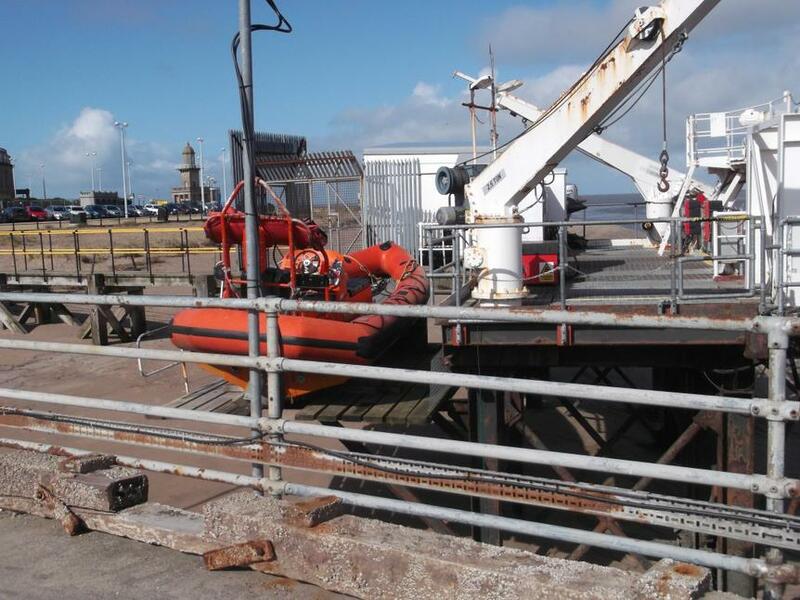 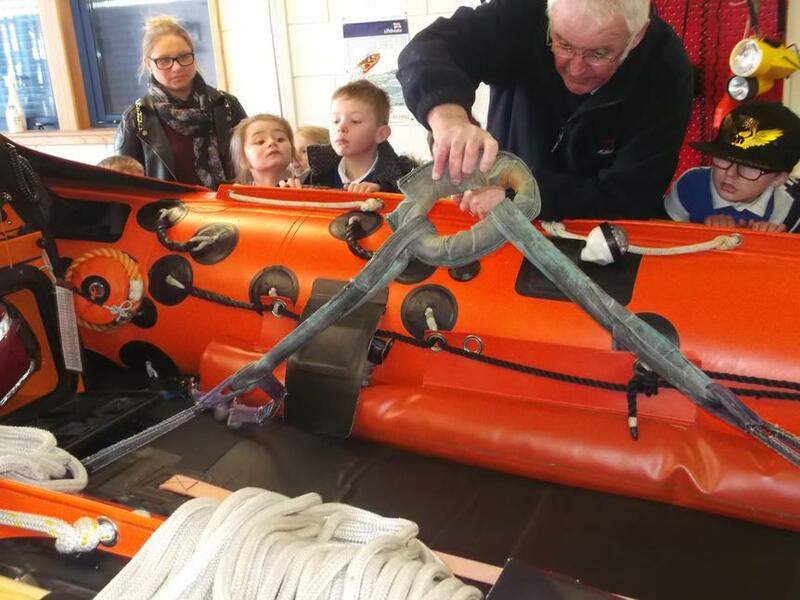 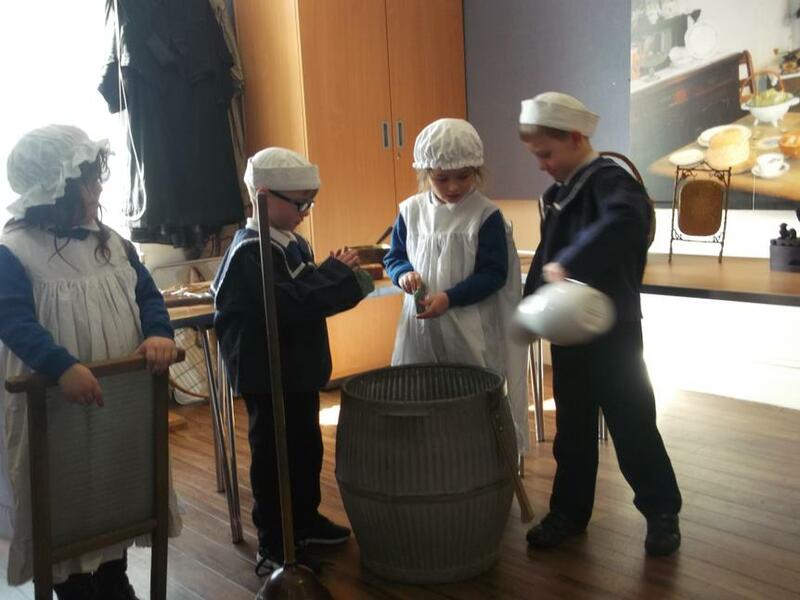 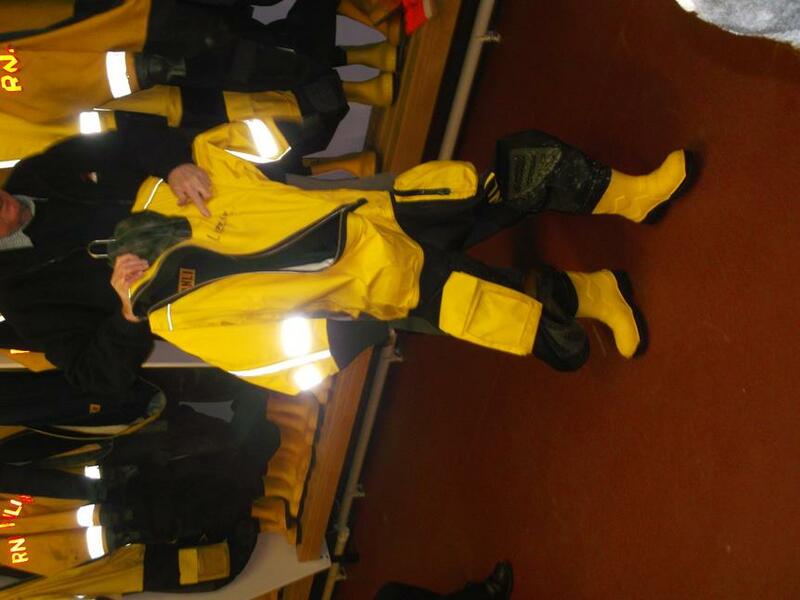 We visited the Life Boat Station and the museum where we learnt about seaside holidays in the past and had the opportunity to play with toys from the past and dress up. 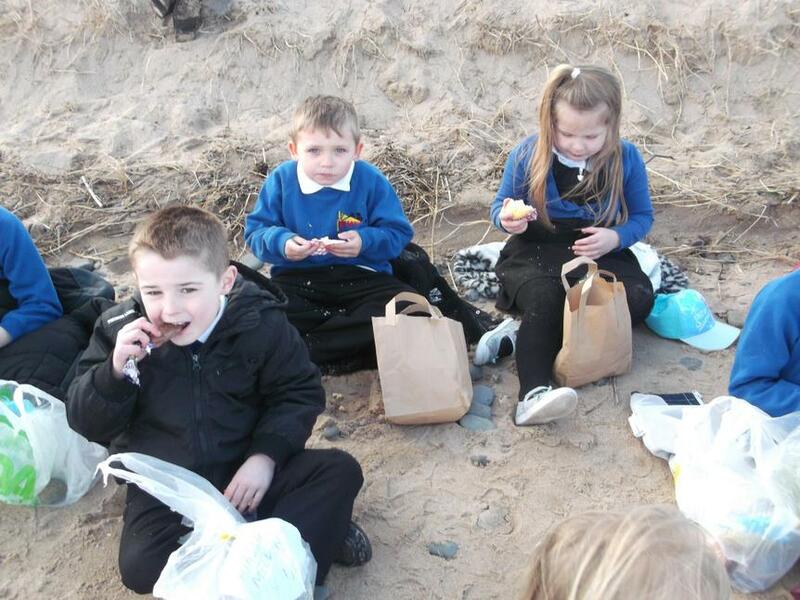 The weather was lovely and we managed to picnic on the beach, collect shells and throw pebbles into the sea-it was a great day.